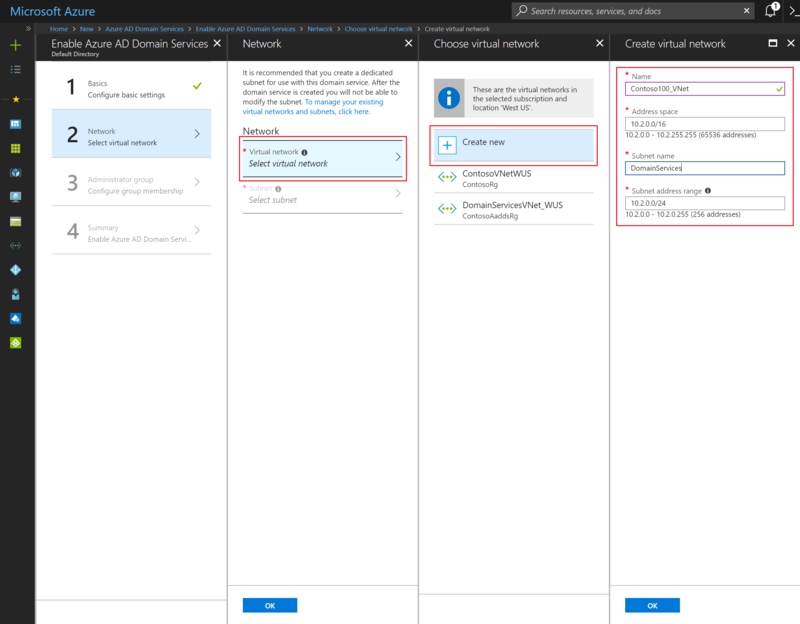 Azure Active Directory Domain Services のネットワークに関する考慮事項のページを参照してください。Refer to Networking considerations for Azure Active Directory Domain Services. 次の構成タスクでは、Azure 仮想ネットワークを作成し、その中に専用サブネットを作成します。The next configuration task is to create an Azure virtual network and a dedicated subnet within it. 仮想ネットワーク内のこのサブネットで、Azure Active Directory Domain Services を有効にします。You enable Azure Active Directory Domain Services in this subnet within your virtual network. 既存の仮想ネットワークを選択して、その中に専用サブネットを作成することもできます。You may also pick an existing virtual network and create the dedicated subnet within it. [仮想ネットワーク] をクリックし、仮想ネットワークを選択します。Click Virtual network to select a virtual network. 新しいデプロイでは、クラシック仮想ネットワークはサポートされません。Classic virtual networks are not supported for new deployments. 新しいデプロイでは、クラシック仮想ネットワークはサポートされません。Classic virtual networks are not supported for new deployments. クラシック仮想ネットワークにデプロイされている既存のマネージド ドメインは、引き続きサポートされます。Existing managed domains deployed in classic virtual networks continue to be supported. Microsoft は、近いうちに、既存の管理対象ドメインを、クラシック仮想ネットワークから Resource Manager 仮想ネットワークに移行できる機能を提供します。Microsoft will enable you to migrate an existing managed domain from a classic virtual network to a Resource Manager virtual network in the near future. [仮想ネットワークの選択] ページに、既存の仮想ネットワークがすべて表示されます。On the Choose virtual network page, you see all existing virtual networks. [基本] ウィザード ページで選択したリソース グループと Azure の場所に属している仮想ネットワークのみが表示されます。You see only the virtual networks that belong to the resource group and Azure location you have selected on the Basics wizard page. 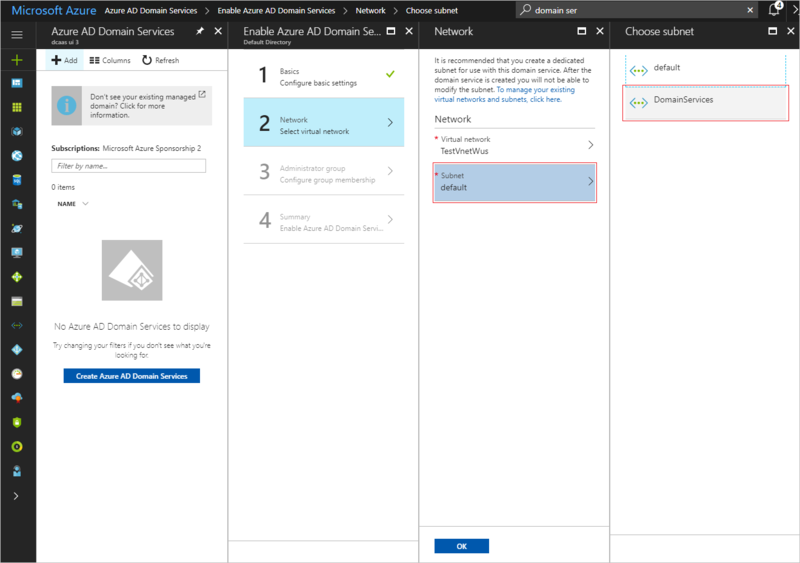 Azure AD Domain Services を有効にする仮想ネットワークを選択します。Choose the virtual network in which Azure AD Domain Services should be enabled. 既存の仮想ネットワークを選択することも、新しい仮想ネットワークを作成することもできます。You can either pick an existing virtual network or create a new one. マネージド ドメインは、Azure AD Domain Services を有効にした後、別の仮想ネットワークに移動できません。You cannot move your managed domain to a different virtual network after you enable Azure AD Domain Services. マネージド ドメインを有効にするには、適切な仮想ネットワークを選択します。Pick the right virtual network to enable your managed domain. マネージド ドメインを作成したら、そのマネージド ドメインは、一度削除しないと別の仮想ネットワークには移動できません。After you create a managed domain, you cannot move it to a different virtual network, without deleting the managed domain. 詳細については、「Azure AD Domain Services のネットワークに関する考慮事項」を参照してください。We recommend reviewing the networking considerations for Azure Active Directory Domain Services before you proceed. 仮想ネットワークを作成する: [新規作成] をクリックして新しい仮想ネットワークを作成します。Create virtual network: Click Create new to create a new virtual network. Azure AD Domain Services の専用サブネットをご使用ください。Use a dedicated subnet for Azure AD Domain Services. たとえば、"DomainServices" という名前のサブネットを作成すると、サブネット内にデプロイされている内容を他の管理者が理解しやすくなります。For example, create a subnet with the name 'DomainServices', making it easy for other administrators to understand what is deployed within the subnet. 完了したら [OK] をクリックします。Click OK when you're done. 必ずプライベート IP アドレス空間の範囲内にあるアドレス空間を選んでください。Make sure to pick an address space that is within the private IP address space. ご自身が所有していないパブリック アドレス空間内の IP アドレスを指定すると、Azure AD Domain Services 内でエラーが発生します。IP Addresses that you do not own that are in the public address space cause errors within Azure AD Domain Services. 既存の仮想ネットワーク: 既存の仮想ネットワークを選択する予定の場合、仮想ネットワークの拡張機能を使用して専用サブネットを作成し、そのサブネットを選択します。Existing virtual network: If you plan to pick an existing virtual network, create a dedicated subnet using the virtual networks extension, and then pick that subnet. [仮想ネットワーク] をクリックして、既存の仮想ネットワークを選択します。Click Virtual Network to select the existing virtual network. [サブネット] をクリックして、新しいマネージド ドメインを有効にする、既存の仮想ネットワーク内の専用サブネットを選択します。Click Subnet to pick the dedicated subnet in your existing virtual network, within which to enable your new managed domain. 完了したら [OK] をクリックします。Click OK when you're done. Azure AD Domain Services の専用サブネットをご使用ください。Use a dedicated subnet for Azure AD Domain Services. 他の仮想マシンをこのサブネットにデプロイしないでください。Do not deploy any other virtual machines to this subnet. この構成を使用すると、マネージド ドメインに支障をきたすことなく、ワークロード/仮想マシンのネットワーク セキュリティ グループ (NSG) を構成できます。This configuration enables you to configure network security groups (NSGs) for your workloads/virtual machines without disrupting your managed domain. 詳細については、Azure Active Directory Domain Services のネットワークに関する考慮事項を参照してください。For details, see networking considerations for Azure Active Directory Domain Services. ゲートウェイ サブネットは、サポートされている構成ではないため、Azure AD Domain Services のデプロイでは選択しないでください。Do not select the Gateway subnet for deploying Azure AD Domain Services, because it is not a supported configuration. 選択したサブネットは、アドレススペースの中で使用できるIPアドレスを、少なくとも 3 個から 5 個持っていなければなりません。The subnet you've selected must have at least 3-5 available IP addresses in its address space. 完了したら、[OK] をクリックして、ウィザードの [管理者グループ] ページに進みます。When you are done, click OK to proceed to the Administrator group page of the wizard.